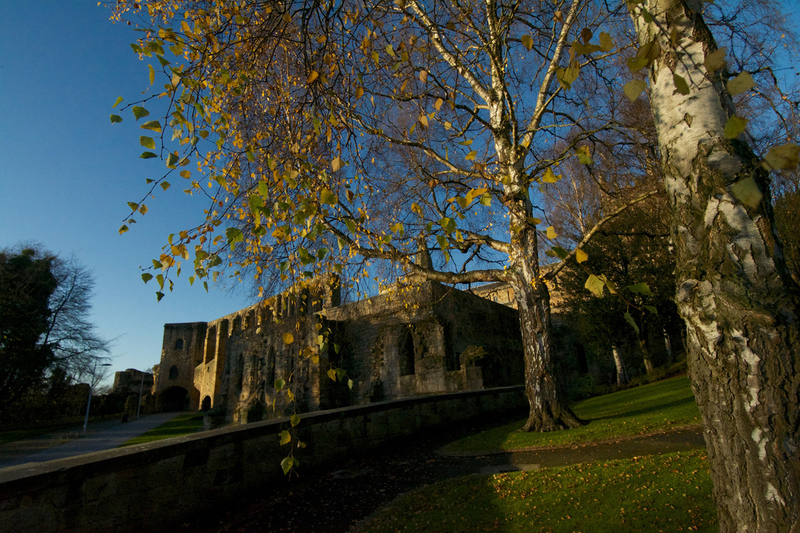 There can be no better time to walk around Dunfermline Abbey than a cold November day, when the last leaves are clinging to the birch twigs like trembling jewels and the slanting sun bathes the old stonework in liquid amber. 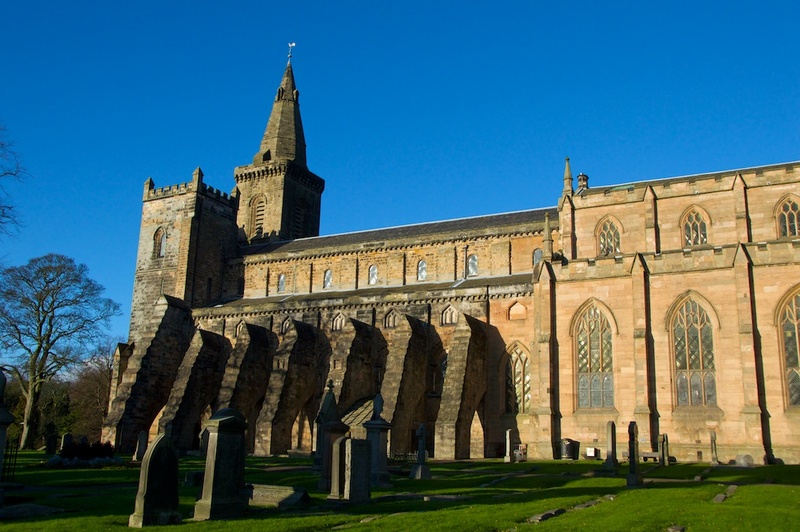 If the spirit of Queen Margaret – bride of the great King, Malcolm Canmore – can be said to rest anywhere, it is probably here, at Dunfermline, that she feels most at home. She was buried here, after all. But the story is not quite that simple. An Anglo-Saxon princess, Margaret was the sister of the ill-fated Edgar Atheling, uncrowned King of England and the last futile hope of the House of Wessex. She had grown up in Hungary, where her father, Edward the Exile, had been sent by the Danish king Canute. The family returned to England in 1057, but an unstoppable force was looming across the English Channel in the shape of William the Conqueror. In 1066, as William advanced on London, Margaret and her mother and sister fled north to Northumbria, where, legend has it, they took ship in a desperate attempt to reach the continent. But fate took a different hand, and a storm drove their vessel into the Firth of Forth. 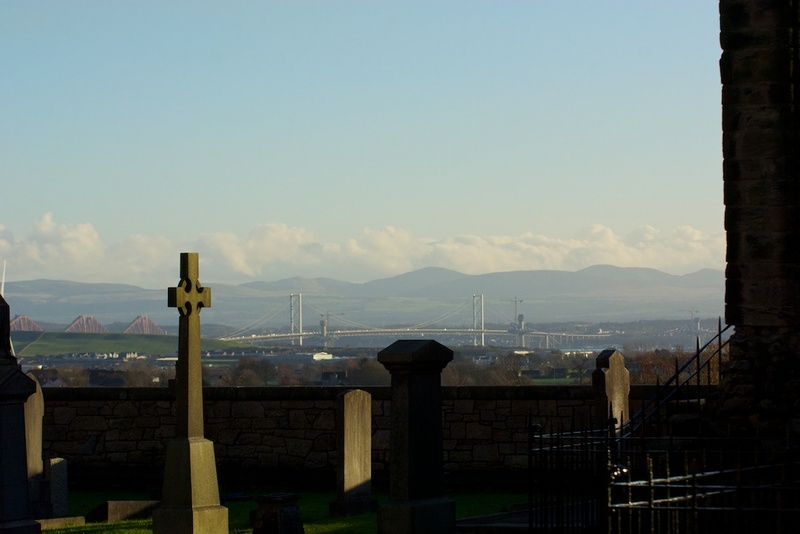 Traditionally, the place where they first set foot in Scotland was St Margaret’s Hope, near North Queensferry. The royal party had little option but to place themselves at the mercy of the Scottish king, Malcolm III or Malcolm Canmore, the ‘great chief’. Recently widowed, Malcolm was enchanted by the sight of Margaret, and the two fell instantly in love. This is probably a lovely weaving of history and legend. The truth is perhaps a little more complicated and political, and if Margaret did indeed marry for love she was one of the few fortunate women of her era and status. 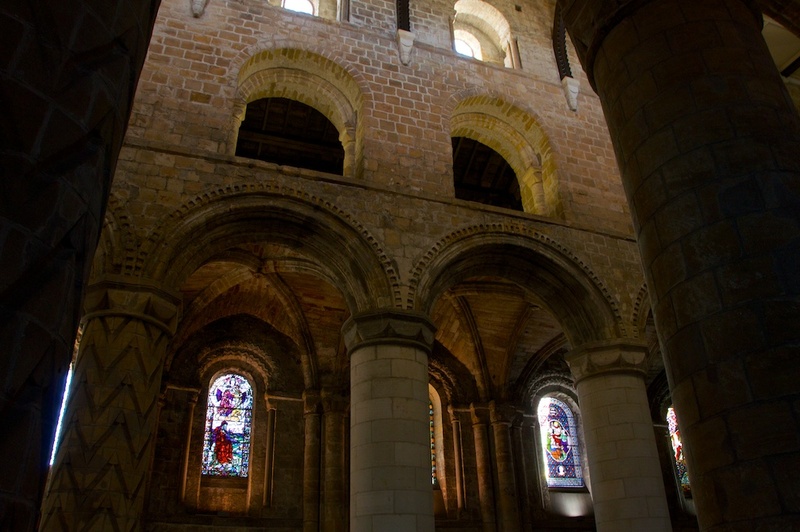 The ceremony took place in 1070 at Dunfermline, in a small and comparatively simple church that may have been founded a couple of centuries earlier by the Culdees. 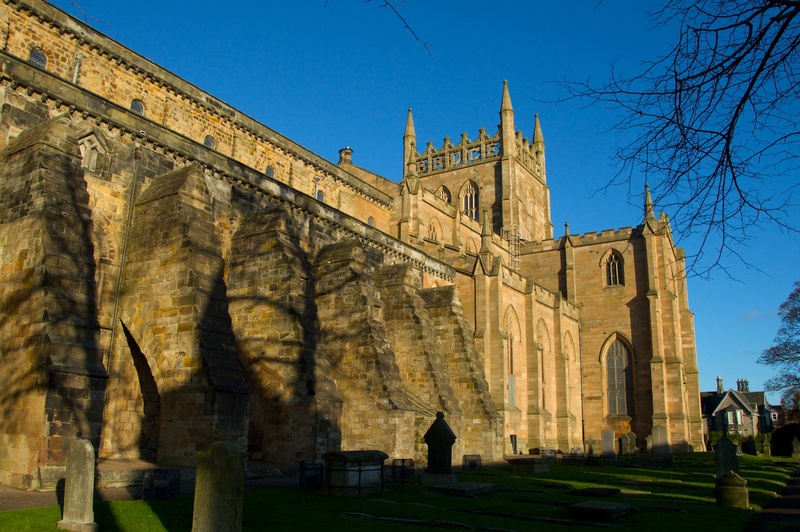 After her wedding Margaret chose to establish a priory at Dunfermline, inviting Benedictine monks from Canterbury to form the community. 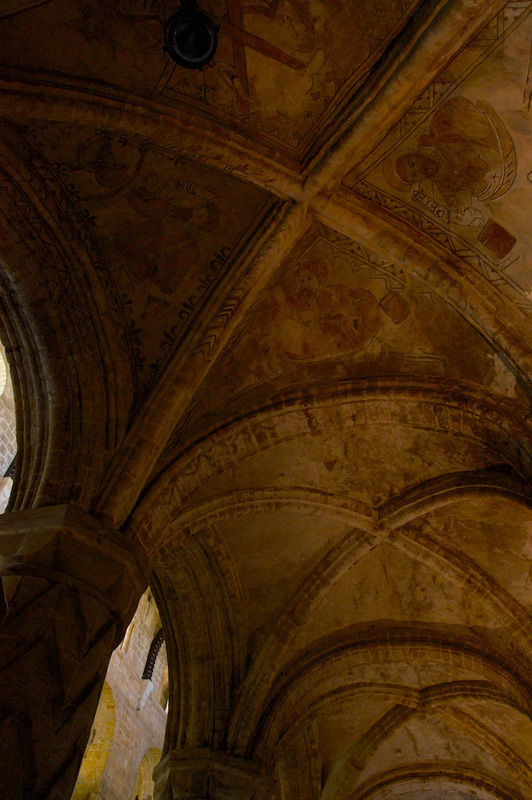 This was the first Benedictine house in Scotland, and their church was dedicated to the Holy Trinity. The royal couple had six sons and two daughters; three of the sons – Edgar, Alexander and David – would become kings of Scotland. Malcolm was a man of action rather than letters, but he worshipped the gentle Margaret. The attachment appears to have been mutual: when Malcolm lost his life at the Battle of Alnwick on 13th November 1093, along with his son, Edward, it was only three days before Margaret herself had died of sorrow. They were buried together at Dunfermline. That was by no means the end of Margaret’s story. She was destined for sainthood… but I’ll tell you more about that presently. Meanwhile, in 1128, it was down to Margaret’s youngest son, David I, to re-design the structure and scale of the Abbey Church and give it the magnificence that must have filled its congregation with awe. David knew how to make a grand entrance, in more ways than one. 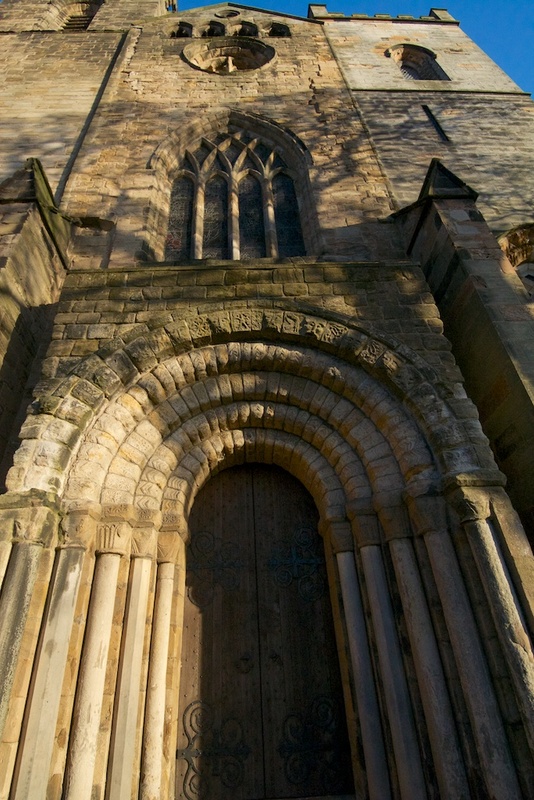 Dunfermline’s Romanesque archways, fluted and carved with layer upon layer of flowers, chevrons and scrolls, are works of art in their own right. You feel as if you can’t sneak really through them: these doorways demand ceremony and a trumpet fanfare. It would help if you had a gorgeous silk gown and a coronet of hammered gold. And just look at these columns. In most other places they would be supporting one of the wonders of the world, like the Colossus of Rhodes. 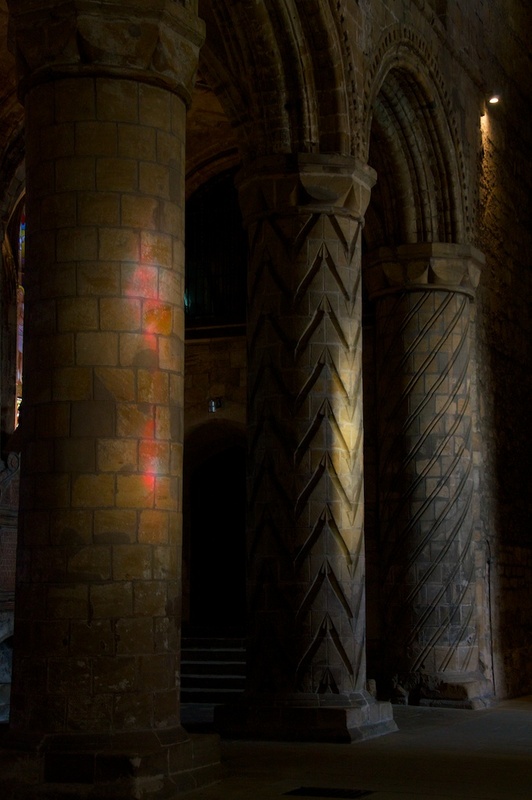 But here they are lurking in perpetual semi-darkness, stone-grey screens for a lightshow of moving colour that streams through the stained glass windows in rainbow cascades. Some of them are carved with geometric lines, razor-sharp and breathtakingly precise. 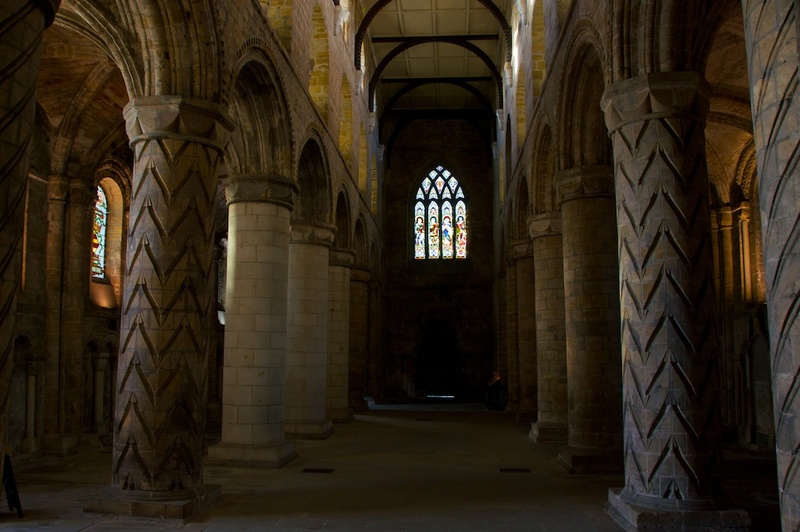 If they remind you of the pillars in Durham Cathedral, that’s because David brought expert masons from Northumberland to work at Dunfermline. Close-up, the stonework looks like a roll of butter that has been sliced with a knife. This huge, echoing, empty cavern of a place was the nave of David’s church and is the only part that still stands. It needs a leap of imagination to visualise it in the time of David I and his successors: candlelight gleaming on silver, painted icons, rich fabrics, pure voices rising up and filling the dark vastness above. 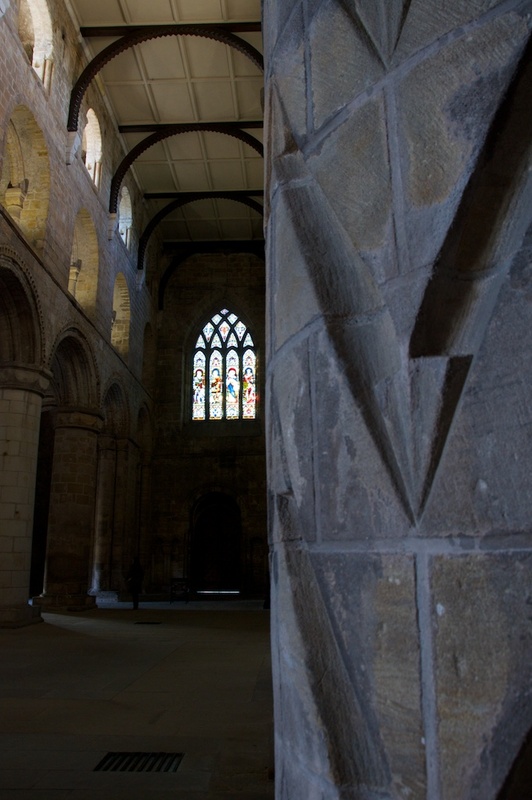 Damaged by Edward I in 1303, and re-built by Robert the Bruce… none of David’s abbeys had a quiet time during the Wars of Independence. 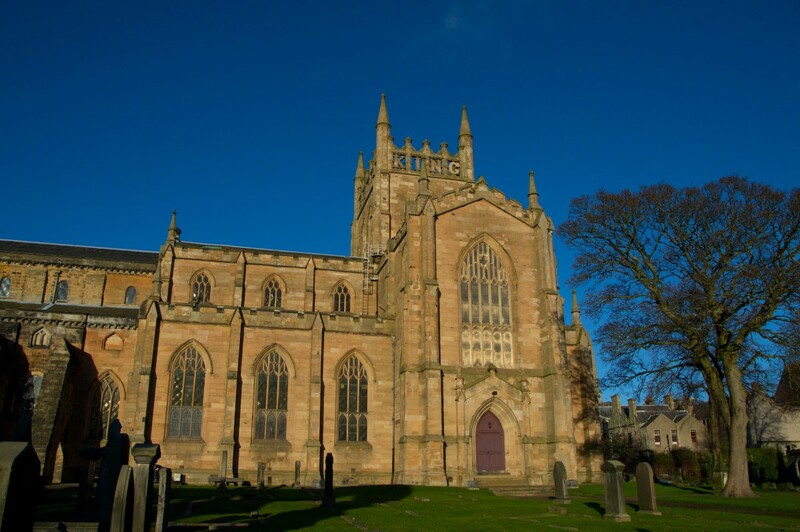 At Dunfermline, Edward seems to have spared the church itself, perhaps in honour of Margaret. In 1560 the Protestant reformers knew no such scruples, although within 10 years those great flying buttresses had been added in an attempt to shore up the walls. This was the old nave, and it was still being used by worshippers. On the east side, the choir must have been in a worse state, and eventually collapsed in a storm; in the early 19th century a new building was put up in its place, and this is still an active place of worship. This reminds me of Dunkeld Cathedral, whose history has taken a similar path. 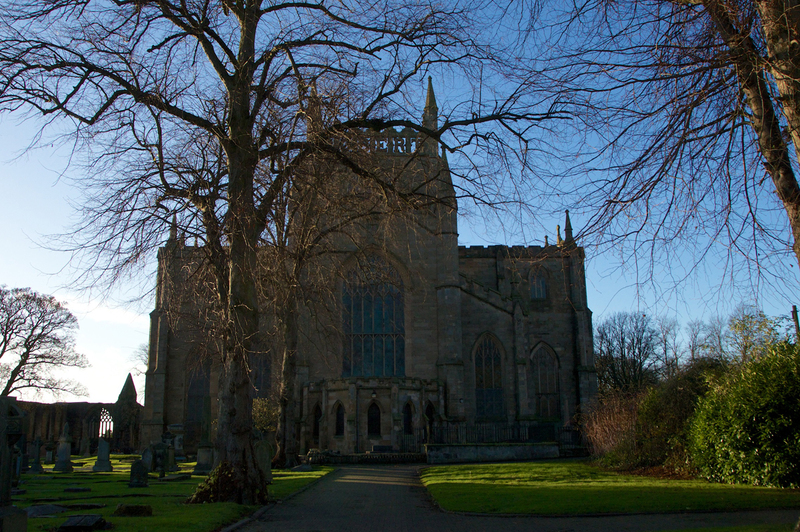 Dunfermline was once the royal capital of Scotland, and the number of monarchs buried here is quite astonishing. 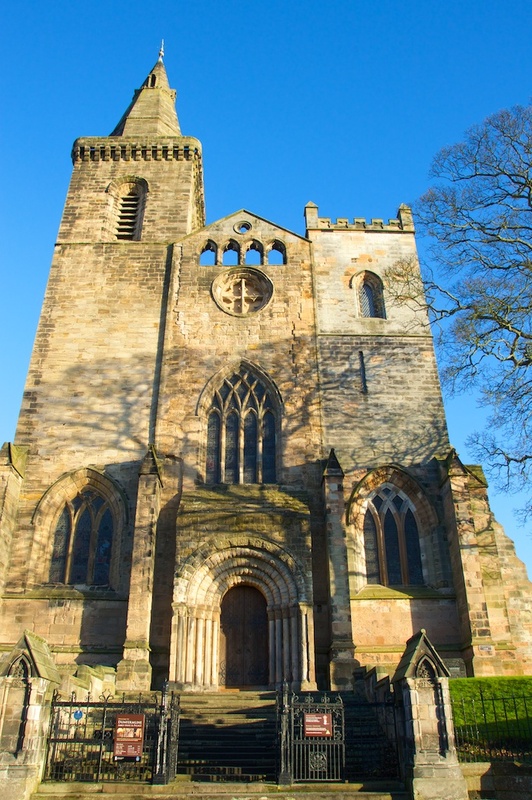 Among them are Queen Margaret and Malcolm III, their children Edgar, Alexander I and David I; Malcolm IV, Alexander III and Robert the Bruce (although the Bruce’s heart lies in Melrose). The mother of William Wallace is said to be interred in the graveyard. 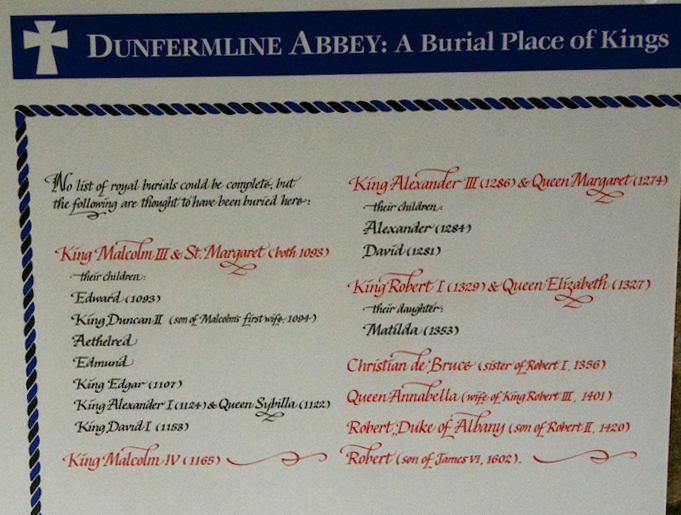 The last royal burial at Dunfermline was Robert, the infant son of James VI and Anne of Denmark, in 1602. Alexander I, fifth son of Malcolm and Margaret, added two identical towers at the west end of the church. Over the succeeding centuries both have been replaced, for different reasons, resulting in a rather mismatched pair; the south (right hand) tower was re-erected in 1807 to a new design, after the original one fell down. There was also a tower over the crossing, which collapsed in 1753. 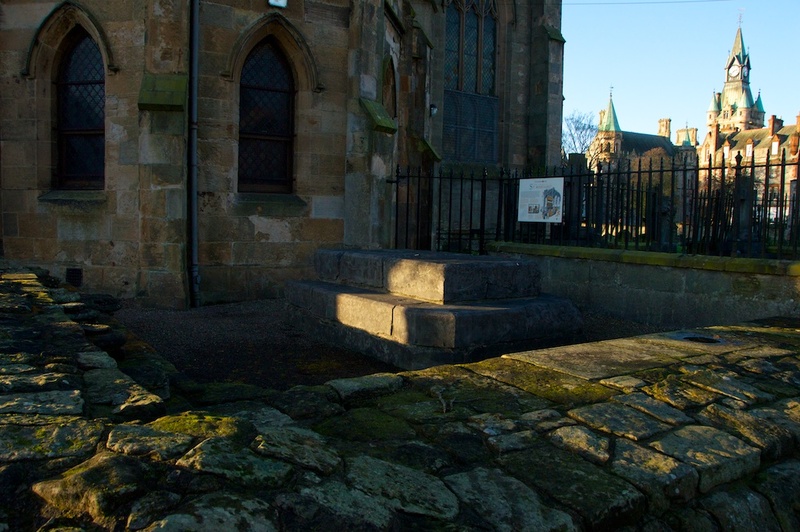 On the more recent half of the church – distinguished by the lighter pink sandstone – the words ‘King Robert the Bruce’ are spelled out on the four faces of the tower. This tribute was incorporated into the new church when the Bruce’s remains were rediscovered beneath the monks’ choir in 1818. 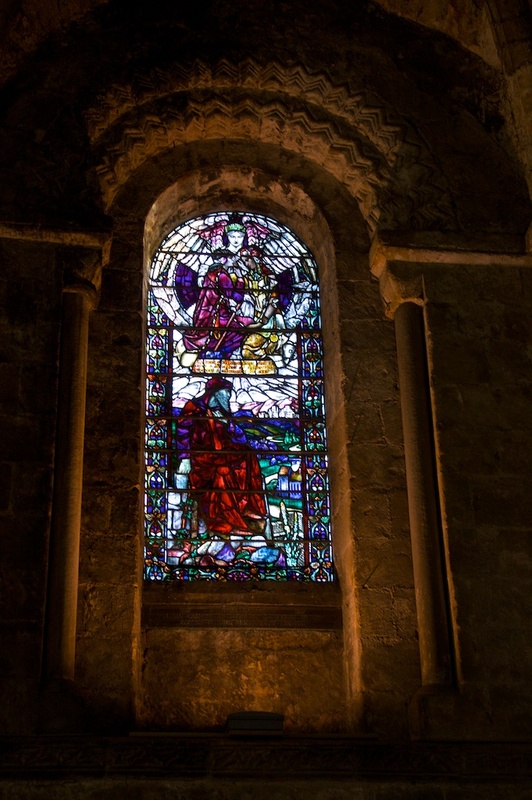 Margaret lived a pious life and devoted herself to charitable works; she established a ferry across the Forth for pilgrims travelling to St Andrews, and performed daily rituals of service for the poor and needy. Under her guidance, the Church of Scotland fell more into line with the Church of Rome. 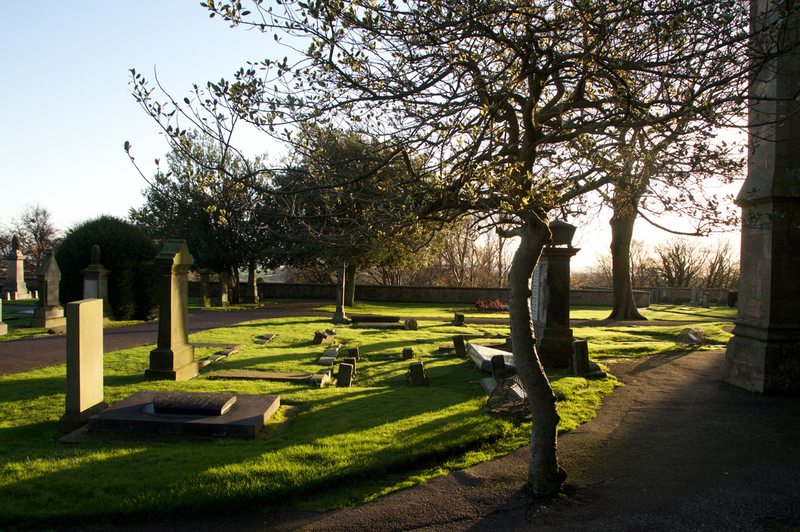 Many stories described her miraculous healing powers, both in life and after her death; when she was buried at Dunfermline, it wasn’t long before sick people were travelling to her tomb to spend the night there, and in the morning many would find themselves cured. 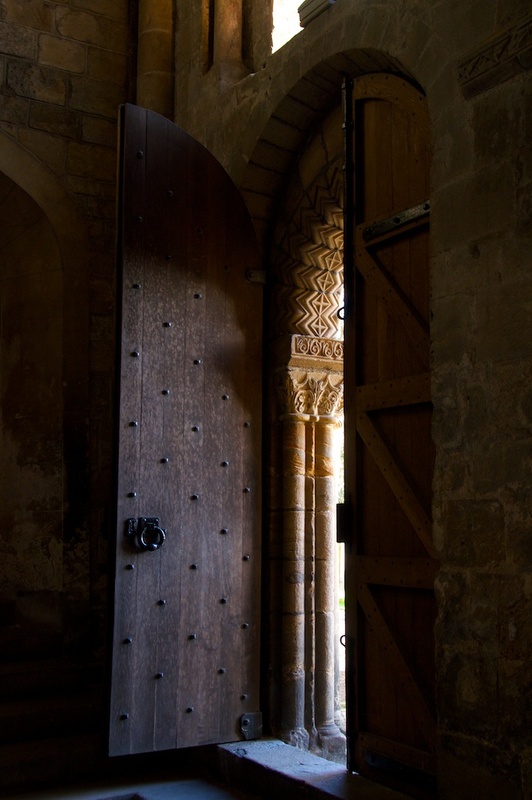 In 1245, some pilgrims began seeing brilliant flashes of light around Margaret’s tomb, and their reports drew the attention of a trio of bishops. They didn’t indulge in much head-scratching before they applied to Rome for Margaret to be canonised; and five years later Pope Innocent 4th issued the relevant proclamation. This must have been a lovely experience; but there was more: when the bearers attempted to carry the bier past the tomb of Malcolm, it became so unaccountably heavy that they had to put it down and could move it no further. An observer suggested that Malcolm’s remains should be moved to the new chapel along with Margaret’s, and, much to everyone’s surprise and joy, this solved the problem. After their posthumous reunion, you’d like to hope that Margaret and Malcolm were left alone, but sadly this wasn’t exactly the case. In the Middle Ages there was a hidden downside to being a saint, because everyone wanted a piece of your skeleton. In June 1566 Mary Queen of Scots was confined to a tiny room in Edinburgh Castle as she prepared to give birth. Possibly stricken with fear, she asked for the skull of St Margaret to be brought to her. Father Edmund Hay, a Jesuit priest, observed that this was “enclosed in the head of the Bust whereupon there is a crown of Silver gilt, enriched with several pearlls and Precious Stones.” It’s a very good job that John Knox didn’t set eyes on it. Mary was safely delivered of a son, who would become James VI; but it seems that Margaret’s head was not returned to its rightful place. I can’t help but make an awful connection with the fate of Mary herself. So where did Margaret’s skull go? The Reformation was by that time in full swing, and no relics or icons were safe from its destructive powers. One source says that in 1597 it was taken to a Jesuit College at Douai in northern France; another account claims that Mary of Guise, mother of Mary Queen of Scots, arranged for all of Margaret’s relics to be sent to France for safe keeping. And it seems that Malcolm once again travelled with them, because the remains of both the king and queen came into the possession of Philip II of Spain, who had them taken to the ancient monastery of El Escorial near Madrid. This seems to have been a safe haven for 200 years, but in the Peninsular War of the early 1800s many relics were scattered and lost. But there is a happy ending: In 1862 Bishop James Gillis of Edinburgh managed to locate a single precious relic of St Margaret and obtained permission from Rome to bring it back to Scotland. It is impossible to know whether this was the only one remaining. For over 100 years it remained in the care of the Ursuline Sisters at the Gillis Centre, Edinburgh, but on 16th November 2008 – the anniversary of Margaret’s death – it was brought to Dunfermline and installed in a new shrine at St Margaret’s Roman Catholic Church. (This is not the church attached to the Abbey, which is Church of Scotland). As ever a fascinating and detailed account. Yes, I had been likening those pillars to Durham! Thank you, Viv! I have yet to visit Durham but from what I’ve seen it’s breathtaking. You will be bowled over. It’s not so remote from you. I know! I think there is a strict policy of no photos inside. But it would be worth it just for the experience. That is so. I had to sketch the pulpit design which I wanted to reproduce in textile. Thank you very much, Jo! I am looking forward to writing the next part. It was a great pleasure to walk around it again in my memory. Such a dramatic place – quite a masculine feel to it, in contrast to somewhere like Dryburgh. Such a great post! I’ve posted a link to it on facebook–my readers will love this! What a fantastic post Jo, you’ve certainly done plenty of research 🙂 the photos are excellent, especially those inside the Abbey. I’ve still not been inside, so it was great to see so much detail. Those pillars are amazing!!!! Thank you very much, Andy! The interior was a challenge, I have to admit, and I’m not good at longer exposures so I relied on Colin for those. Yes, the pillars are jaw-droppingly huge. I can remember how awestruck I was when I went inside. I’m pretty sure you’d get some great photos in there! That’s lovely to know, and thank you again. I’ve got to say that of all the places I’ve written about, this one took the longest and I’m really only half-way through. And I got a bit sidetracked with Margaret! Her relics took on a life of their own, almost literally. But I cannot wait to see your images, whenever you do post about it! Thank you very much, Lynne. You’d love the windows, I’m sure. Yes, you can almost feel the weight of history there! A remarkable building with so many stories attached to it. Your photographs are wonderful, I especially like that one of the open door showing the stonework of the arch, it’s magnificent. Before the new bridge started to go up there was a competition to find a new name for it. Voters could choose from several options, one of which was St Margaret’s Crossing. I voted for that because I liked the idea of remembering the pilgrims making their way across by small boat, but it was beaten by Queensferry Crossing. I enjoyed reading about Margaret and look forward to part 2. Great article and photos, Jo. Thanks for all your hard work. The romantic in me can’t help but hope that somewhere, in some form, Malcolm and Margaret are together and will remain so. David I certainly knew what he was doing. If this is just the nave, the rest of the church must have been spectacular. Thank you, Pat! 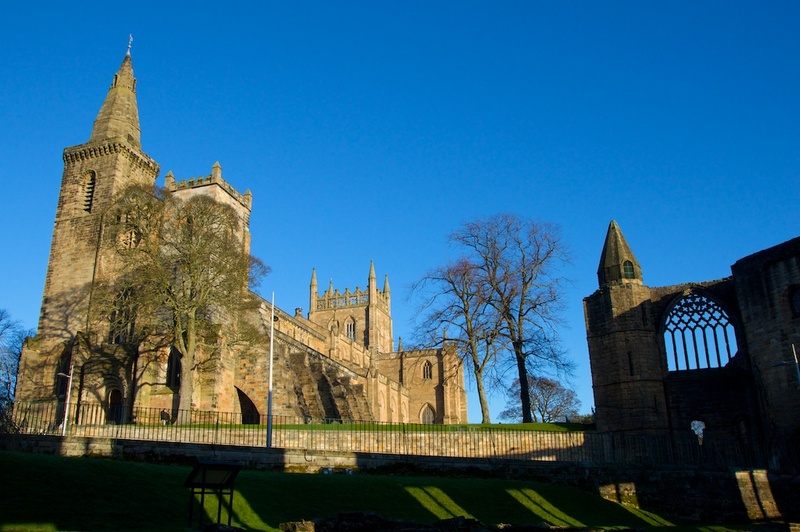 For me, writing about places like Dunfermline is a great way of learning about them as well. I never know what I’m going to find out! I do certainly hope, and part of me knows, that Malcolm and Margaret are together. David seems to have inherited his father’s power and presence and his mother’s sense of piety. I would love to have seen the entire Abbey church when it was finished! As you say, it must have been truly spectacular both inside and out.